Editor’s Note: Currently, there are four statutory committees whose duties include overseeing the operations of four of the legislative staff agencies. It appears that the General Assembly created each of these committees with the goal of increasing the effectiveness of the General Assembly, improving its ability to pass well-considered legislation, and improving its ability to provide independent oversight of the use of public money. Over the next four weeks, we will look at each of these committees – the Legislative Council, the Audit Committee, the Committee on Legal Services, and the Joint Budget Committee – why they were created, how they operate, and their current duties. The Colorado General Assembly’s Legislative Council is one of its most vital committees, at times mistaken for the state’s hard-working Legislative Council staff for which it provides oversight. The public might be more familiar with interim study committees, which often receive testimony from Colorado citizens on a variety of subjects, but the Legislative Council committee also takes up a number of important tasks. Colorado’s Legislative Council was statutorily created in the 1953 legislative session. At the time, legislatures usually met for much shorter sessions than they do today, which caused some legislators to feel that the body wasn’t functioning as well as it should or that its role was being usurped by governors while they were not in session. Echoing the sentiment of other state legislatures of the time, Colorado’s Legislative Council was seen as a means to help legislators address problems that would otherwise not be seeing legislative solutions. The Council was designed to meet during the legislative interim to study issues of interest and provide policy recommendations to the General Assembly. When it created the Legislative Council, the General Assembly immediately realized that it would need staff support. The first Legislative Council staff director came and went so fast that his name has all but been erased, but the second director, Shelby Harper, started in November 1953. With a single assistant and a $12,000 appropriation, the work of serving legislators began. Harper moved on to another career pursuit in the winter of 1957 and was succeeded by Lyle Kyle, who served as director until 1985. In the 1967 legislative session, the Legislative Council staff was comprised of enough people to staff, for the first time, the three busiest committees in each house: Judiciary, State Affairs, and Business Affairs. There is hereby created a legislative council, referred to in this part 3 as the ‘council’, which consists of an executive committee, six senators with majority party members appointed by the president of the senate and minority party members appointed by the minority leader of the senate, with the approval of a majority vote of the members elected to the senate, and six representatives with majority party members appointed by the speaker of the house of representatives and minority party members appointed by the minority leader of the house of representatives, with the approval of a majority vote of the members elected to the house of representatives. Today, within the Legislative Council, the Executive Committee consists of the President, Majority Leader, and Minority Leader of the Senate and the Speaker, Majority Leader, and Minority Leader of the House of Representatives. The Speaker of the House of Representatives and the President of the Senate alternately serve one-year terms as the chair and vice-chair of the Executive Committee. In 2017, President Kevin Grantham has served as chair. 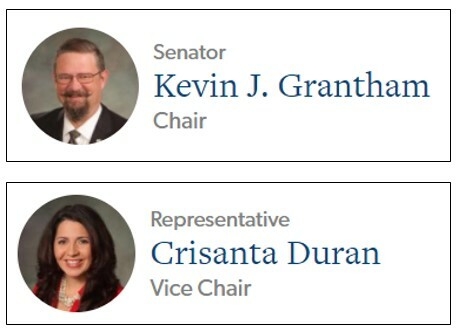 In 2018, Speaker Crisanta Duran will assume the chairmanship. The remaining members of the Council are appointed no later than 10 days after the first regular session of each General Assembly convenes. Membership on the Council terminates with the appointment of a member’s successor or upon the termination of a member’s term of office in the General Assembly, whichever occurs first. A member may be appointed to succeed himself or herself. In 2016, Senate Bill 16-156 changed the authority of the President, the Speaker, and the minority leaders to make temporary appointments. Now, any of these appointing authorities may temporarily appoint a member to replace a current committee member without the approval of a majority of the members elected to the applicable body. Examine the effects of constitutional provisions and statutes and recommend desirable alterations. The Executive Committee of the Legislative Council meets separately, and its duties include oversight of the legislative service agencies and their directors, establishment of policies regarding legislative management and legislative procedures, and introduction of an annual legislative appropriation bill. The Executive Committee is responsible for approving the Legislative Council staff budget reviewed by the Legislative Council, along with the budget requests of the House and Senate and other legislative staff agencies. The Executive Committee also exercises legislative management functions when the General Assembly is not in session and may set the date for the convening of the next regular session of the General Assembly. The Legislative Council is scheduled to meet at 10 a.m. on November 15 in Committee Room 271 at the Colorado State Capitol to review interim committee legislation. At the time of this posting, the agenda has not been released. Previous Post: What’s so Special about a Special Session?